James William “Jimmy” Buffet is a musician, writer, and entertainer who still packs a considerable amount of punch as a touring rock’n’roll performer, capable of drawing capacity crowds well past the prime of an outstanding career. Closing in on half a century as a singer-songwriter, Buffet at this point normally does 20-30 shows a year (picking and choosing locales) at which he does a greatest hits package without fail to adoring, worshipful audiences. His devoted fan base goes by the name of “Parrotheads.” They turn each concert into an event highlighted by concertgoers wearing flip-flops, coconut bras, worn-out shorts, and tacky Hawaiian shirts, tailgating on a massive scale typically involving coconut shrimp, jerk chicken, lobster brisket, and cheeseburgers, and consumption of lots of alcohol—most often in the form of margaritas, Hurricanes, beer, and various other assorted tropical drinks. Buffet’s musical career actually began in the late 1960s, but really took off in the following two decades. Initially a country musician based in Nashville, he relocated to Key West, Florida early on and released a whole slew of albums that gained him a persona as an easy-going party animal and inveterate beach bum. The records in question included A White Sport Coat and a Pink Crustacean (1973), Living and Dying in ¾ Time, A1A (both in 1974), Havana Daydreamin’ (1976), and Changes in Latitudes, Changes in Attitudes (1977). He is most well-known for a series of ten or so songs tending to accentuate his image as a good times kind of guy. They are: “Margaritaville,” “Come Monday,” “Fins,” “Volcano,” “A Pirate Looks at Forty,” “Cheeseburger in Paradise,” “Changes in Latitudes, Changes in Attitudes,” “One Particular Harbor,” and “It’s Five O’Clock Somewhere.” Buffet has been backed up over the years by the Coral Reefer Band. Branching out as a writer over time, Buffet has struck gold both as a novelist and memoirist. His two most notable works of fiction, Tales from Margaritaville (1989) and Where is Joe Merchant? (1992), both spent more than seven months on The New York Times Best Seller list. A Pirate Looks at Fifty (1998), Buffet’s autobiography, went straight to the top of The New York Times Best Seller list and stayed there for over half a year. He accomplished an extraordinary feat achieved by only seven other authors in reaching number one on both the fiction and non-fiction lists of America’s most prestigious newspaper. Buffet proved himself to be an adept and successful businessman. He utilized his fame as a musician and a dedicated fan following only a few other performers could hope to match as a foundation upon which to enter into several business ventures. These enterprises ranged all the way from owning or licensing Margaritaville Café and Cheeseburger in Paradise restaurant chains to opening a Margaritaville store in Key West in 1985. Mention should also be made of Radio Margaritaville, which first appeared on Sirius Satellite Radio in 2005. It, of course, broadcasts the extensive music library of Jimmy Buffet, and additionally devotes a lot of air time to reggae, tropical rock, and beach music. Entire live concerts of Buffet show up frequently, along with archived shows. “JB” (one of Buffet’s nicknames) has connections with Bill Clinton extending over a period of twenty-five years or so. 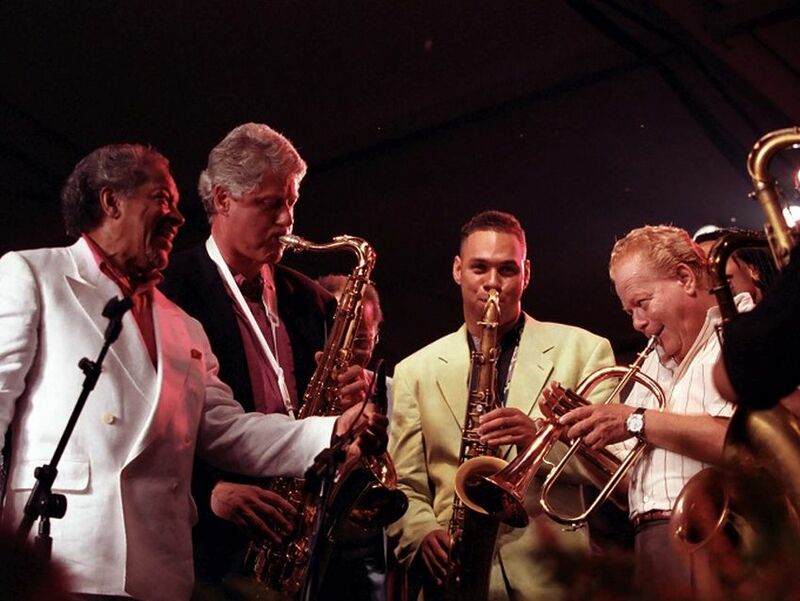 He performed at Clinton’s Tennessee Inaugural Ball on January 21, 1993, with the President supposedly joining in the festivities by playing the saxophone. 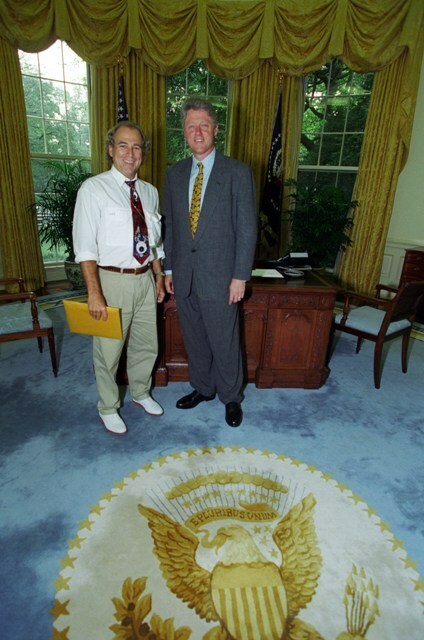 While the Arkansas native was in office, Buffet put on a brief show at Clinton’s 51st birthday party in August 1997 (Edgartown, Massachusetts) and did the same at his 54th birthday party in August 2000 (South Lawn of the White House). In recent years, he made an appearance at a concert raising funds for victims of Hurricane Irene. This occurred on August 29, 2011 and featured Buffet singing the Grateful Dead tune “Uncle Johns Band” to former President Bill Clinton and former First Lady Hillary Clinton at The Stephen Talkhouse in Amagansett, Long Island. 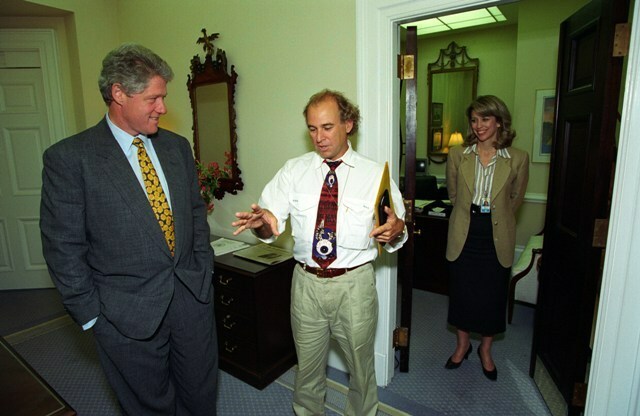 The photos of Buffet here show him touring the West Wing of the White House with President Clinton on June 17, 1993. 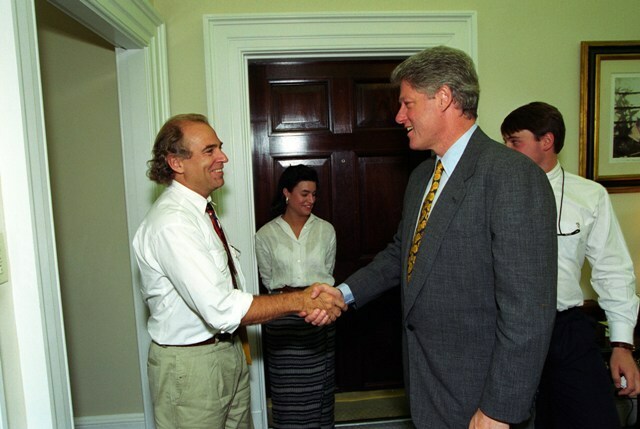 In one shot he is shaking hands with President Clinton, in another shot he is posing with President Clinton, and in the final shot he is carrying on a conversation with President Clinton. The other people in the photos are unidentified.